The built in NEFF KI1213F30G Fridge has a total capacity of 144 litres over 4 safety glass shelves, 3 door trays, including 1x dairy compartment and 2 x egg trays. Neff has designed the vegetable box to have adjustable humidity levels with the HydroFresh feature. 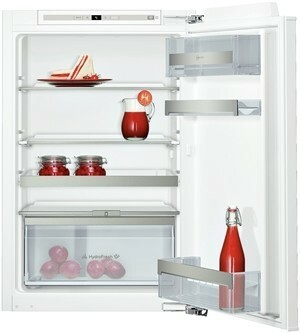 This improves the shelf life of your fruit and veg and keeps them fresh and crisp for longer. By keeping them at the right humidity levels means they can last up to twice as long in comparison to a standard fridge. There is a rapid cooling feature which quickly chills your newly bought produce so it matches the temperature inside the fridge. While FreshSense keeps a constant temperature inside the fridge by the use of intelligent sensor technology. The KI1213F30G comes with an impressive A++ rating for energy efficiency helping to save you money on your energy bills.